Well, this great contribution with many stars in the original cast – such as Barbara Cook as Cunigunde singing “Glitter and be Gay” as “Mr. Bernstein’s own version of how a jewel song should be written” (to quote Brooks Atkinson from the Times) – did not fare too well. Certainly not compared to a hit such as West Side Story. Now, to celebrate Leonard Bernstein’s 100th birthday, many theaters who couldn’t get a license for WSS have opted for Candide. 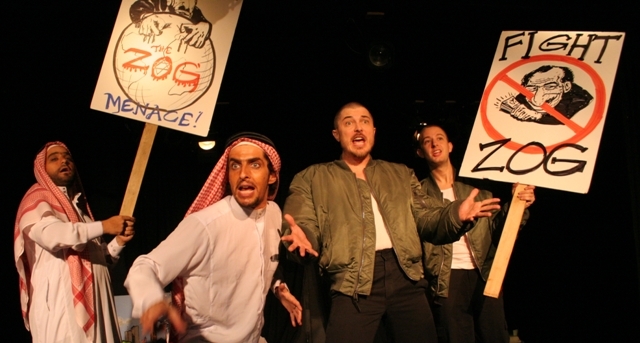 Which seems to work well with contemporary audiences as an eclectic, yet sophisticated, mix of styles and black humor. 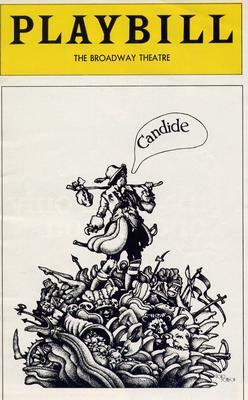 Playbill for the 1974 version of Leonard Bernstein’s “Candide,” directed by Harold Prince. The Komische Oper Berlin, with its remarkable operetta tradition, is offering a new Candide, too. 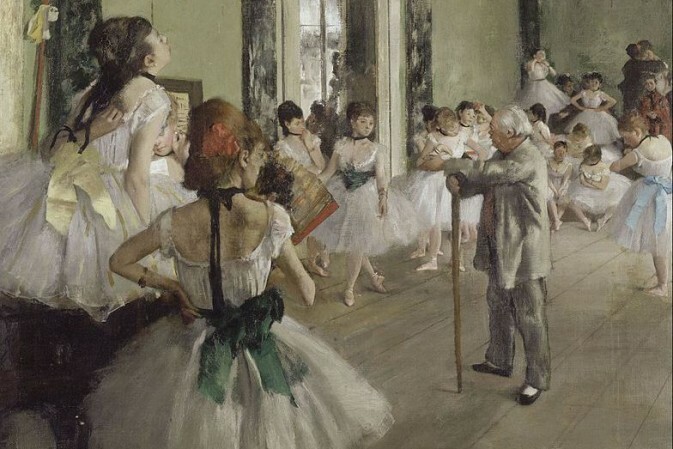 For which Mr. Bernstein’s two daughters came to attend opening night. The production by Barrie Kosky isn’t quite in the class of his various other operetta offerings, though there are some stunning visuals in between with golden showers (for the Eldorado scene), and though Nicole Chevalier presents an outstandingly choreographed “Glitter and be Gay” that’s fun to watch, though not memorable to hear. It’s not “a really spectacular disaster,” as Walter Kerr wrote about the 1956 premiere in the Herald Tribune. (“Who is mostly responsible for the great ghostly wreck that sails like a Flying Dutchman across the fogbound stage of the Martin Beck?”) But it’s not the anticipated triumph either. Yet it is an opportunity to see Candide anew in Berlin and hear it in an unmiked version. (Which I don’t consider a plus.) And in the context of Paul Abraham and Oscar Straus, which is a double plus and a context audiences on Broadway did not have in 1956. Though they had their Rombergs and Frimls and Herberts to compare the score to. 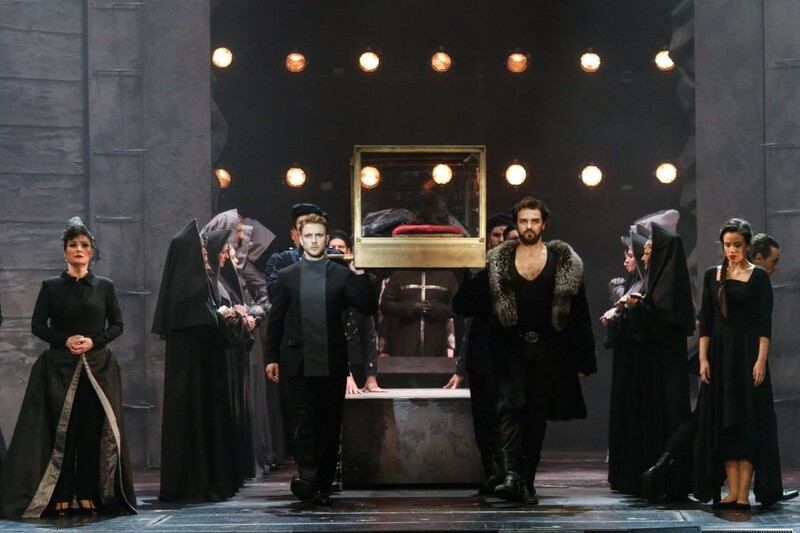 The Komische Oper Berlin decided to use the 1999 National Theatre version as the basis for their production, not the 1974 Harold Prince version that sparked the renewed interest in Candide. And they didn’t go all the way back to the 1956 original, which would have been interesting. The casting in Berlin is a far cry from what Kristin Chenoweth as Cunigunde and Patti LuPone as The Old Lady have to offer on DVD. The new German translation isn’t much help either, if you’re lucky enough to understand a single word. And in the end, Dagmar Manzel would blow away each and everyone in this new Candide, if only she had been cast in it. She’s back in Perlen der Cleopatra in December; which is everything that Candide should be too, but isn’t. Which is amazing: that Oscar Straus could win out over Bernstein! 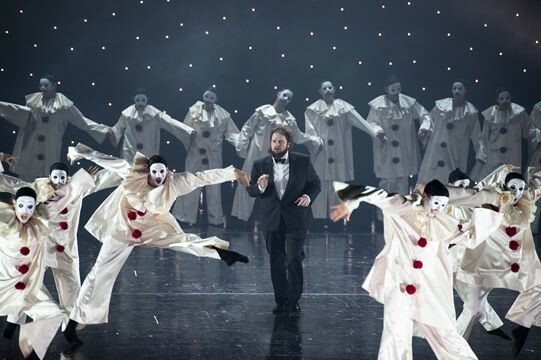 I have to admit: demonstrating this with a new production is quite a stroke of genius on Barrie Kosky’s part. For which I’ll love him even more dearly than I already do. Cover of Donald Barthelme’s “Snow White” book. By the way, after years of absence it seems that operetta is making a comeback in American popular culture, but also (even more surprisingly) among avant-garde European composers. One of them is Micha Hamel, born in Amsterdam 1970. He decided, for the 2007 /2008 season, to write his new stage work Snow White as a “tragic operetta.” It’s based on the 1967 novel by Donald Barthelme and premiered at the Nationale Reisopera: a success. Because audiences were willing to accept the eclectics of the music, the madness of the story about a girl who’s looking for her dream prince – while she regularly ‘showers’ with her flat mates. Mr. Hamel, on his part, said he enjoyed the freedom the genre operetta offered to break free from the standard expectations of Contemporary Music. Their operetta premiered in Los Angeles in 2006, got rave reviews from The New York Times and received a prize from the LA Times. It then came to Amsterdam in 2009 to Opera aan het Ij and caused quite a media sensation there too. Since then, no one has dared to touch the show because of its prevailing political relevance – which seems to scare self declared ‘subversive’ culture people in Germany. In a way, all these new operetta approaches are not too far removed from what Leonard Bernstein and his team tried to do in 1956. Because Bernstein’s ‘best of all possible worlds’ can also be read as a comment on the forced Doris-Day-optimism of post-war society. Let’s hope for Nitzberg, Neill, Mr. Rainbow and Hamel that their 21st century operettas age as well as Leonard Bernstein’s does. For more information on cast and future performance dates of Candide at Komische Oper Berlin, click here. It’s by no means Bernstein’s best work – “Wonderful Town” is a much better show but comparatively rarely staged! the main problem with Candide is the book which just doesn’t work, even in the several revisions it has been given. 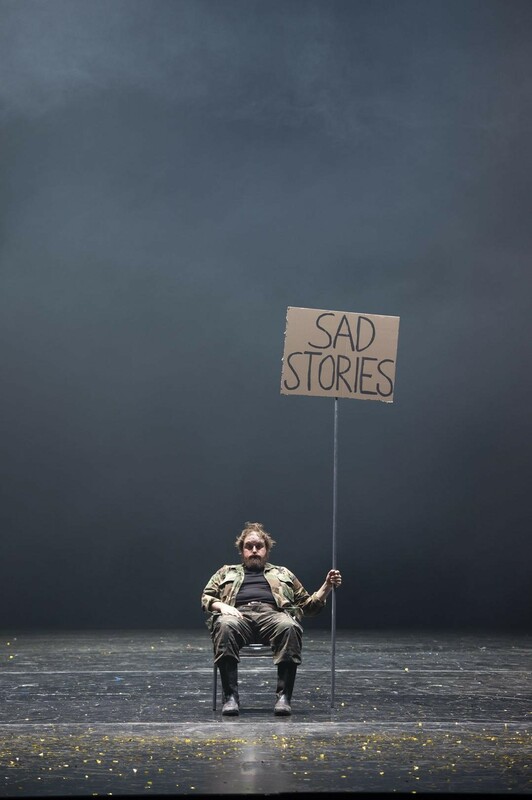 The UK National Theatre production was probably its best outing, but nothing like as successful as the NT’s other musicals Still, it should be worth seeing at KOB. By the way, the original UK production starred he incomparable Max Adrian. If you are too young (Kevin!) to have heard him, do try to obtain the original UK cast recording – very stylish. I approached Ohio Light Opera’s 2018 production of “Candide” with trepidation. Well, really, one approaches any production of “Candide” with incipient dread. However, all of that was quickly swept away by what transpired, which was revelatory. Somehow, Stephen Daigles’ alchemy, a capable cast, brilliant conceptualization, and beautiful production design, all came together to make this famously tricky piece flow, sing, soar, and yes: work…a most rewarding, moving experience. 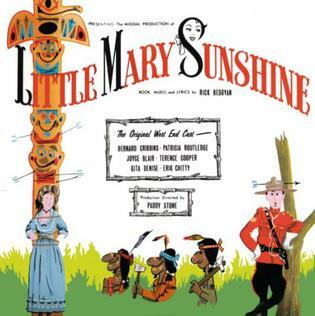 Incidentally, I did see the 1958 concert production (Hellman’s book) with Martyn Green, Robert Rounseville, Mary Costa and Irra Pettina, but don’t ask me to elaborate. There are some tenuous memories of Costa and Green delivering the goods.